We have a lot of endings/beginnings going on around here. Saturday was the last baseball game of the season for my oldest. I will miss wandering around the humid greenery of Knight’s Park in the early mornings and early evenings, mostly chasing my younger two and occasionally getting to see my oldest give the ball a good thwack. This Friday is the last day of first grade for my oldest. We are also saying goodbye to the school principal, who is moving on to a different job in the district. We’ll miss him; he is great with the kids. 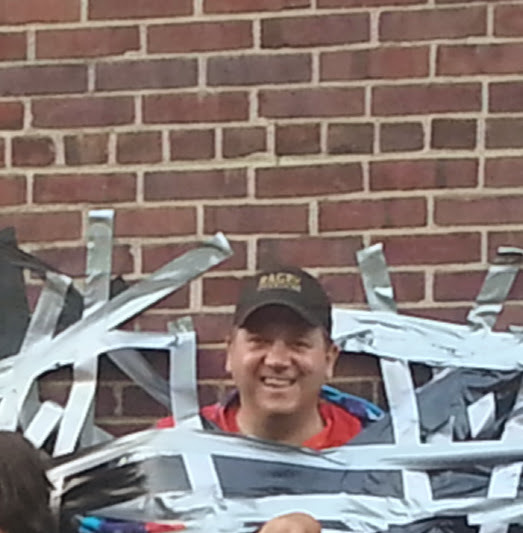 Last night the school had a kids vs. parents kickball game, and the principal allowed himself to be taped to the wall with duct tape. (It had something to do with a fundraiser earlier in the year.) Good times. So school and baseball are over, and summer and swimming lessons are beginning. My oldest had his first one ever (I feel like a slouch) last night, at a nearby YMCA. He seemed to really enjoy it. Those will be every Monday night until July 19. In other news, the weather was pleasant over the weekend so I tried to get a last burst of cleaning/organizing/cooking done before it gets too hot to move. I made fantastic chocolate chip cookies Thursday night; recipe to come. Lots of laundry on the line again. I started an ambitious total cleaning of the kitchen on Saturday, inspired by a Real Simple flowchart, but was sidetracked by the discovery of a piece of rotting meat behind the microwave. Super, super gross. It was in its original sealing, but still had leaked all over. And. There. Were. Maggots. My husband took the meat out for the BBQ we had last weekend and then I guess it fell behind the microwave. I had been catching a whiff of something bad, but it took me a while to figure it out. Needless to say, I brought out the heavy-duty traditional cleaning products. Unfortunately the Real Simple flowchart was silent on the subject of unexpected meaty maggoty disgustingness. Yesterday and today it has been HOT. I will probably go out and get a rotisserie chicken for dinner tonight, and then make mashed potatoes to go with it. I also have to work up the balls to call the place that made my couch slipcover, because I’m finally getting the back cushions that go with it… a full six months after the slipcover was done. I feel (and my husband STRONGLY feels) that I’m entitled to a discount. Because really? Six months? But this kind of thing is not my strong suit. What I really want to do is make some more homemade lemonade, point the kids in the direction of the pool/slide, and finish reading Blue Plate Special by Kate Christensen. I downloaded it to my phone during the swim lesson last night and I’ve been reading it whenever I can since. It’s a memoir; she’s a novelist. Finally, if you’ve read this far, you get a treat that I can’t put on Facebook: a conversation between my daughter and my husband when we first got up this morning. H: But who has a great big belly? H: No I don’t! Mommy does! F: And… you have a big peepee, Daddy.